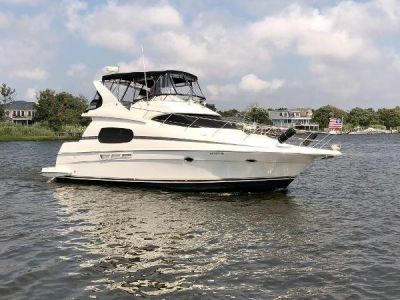 Designed for entertaining and coastal cruising, the Carver 410 Sport Sedan combines the interior space of a small motoryacht with the versatility that comes with a cockpit and extended swim platform. 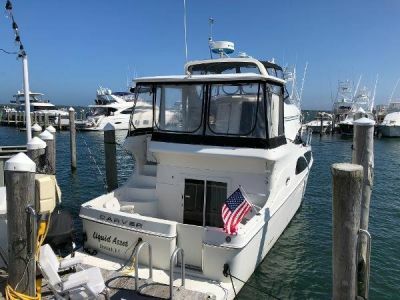 The Sport Sedan has a spacious full-beam salon, a huge U-shaped Ultraleather lounge with built-in recliner to starboard, a large galley area with full-size refrigerator, convection microwave, Corian counter, and tons of storage. 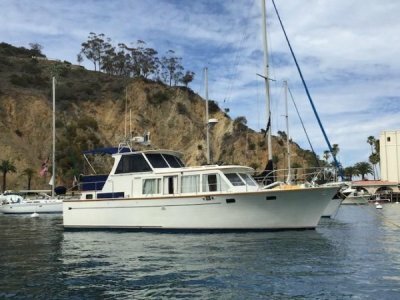 Below, the master stateroom with private head and separate shower is forward, and the guest stateroom is amidships with a double bed that converts to twin berths and private access to the day head. A hatch in the salon sole provides access to the engine room. Molded steps to port in the cockpit lead to the single side deck, and starboard steps access the flybridge with its wet bar, circular lounge seating, and three helm chairs.